Technically, I shouldn’t be including this wine in my series because it’s a blend, in this case of 70% Albariño, 20% Caiño and 10% Loureiro. 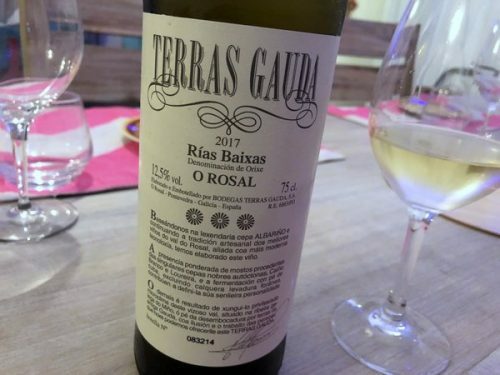 Stainless steel fermented with vineyard yeasts carrying out the fermentation, this is a slightly richer style (O Rosal is a warmer subregion in Rias Baixas running along the border with Portugal), but it still has a beautiful crispness. This is a really stylish wine, and it’s remarkable to see this quality in a 1.5 million bottle production run. Thanks for this recommendation. I live in NE Spain, and Alvarinho, or Albarino, is not all that common here. I will have to look for this at some of the local shops though. Hello Jamie….i really like the way you go in-depth, on the wines you discussed. I am a newbie to the wine world, and i am learning all i can. Your blog posts are very informative. Job well done!.